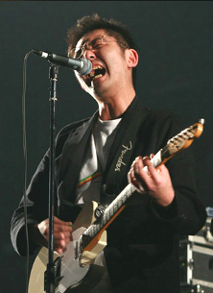 Mukai Shutoku's former band Number Girl is renowned as one of the most important and influential bands in Japanese rock history. The manner in which Number Girl abruptly disbanded in 2002 at the peak of its popularity was heartbreaking to legions of fans throughout the country. Having been the frontman and creative mastermind behind Number Girl, Mukai Shutoku inherited an immediate and substantial fanbase for his subsequent project, ZAZEN BOYS. But instead of sticking to a proven formula (i.e the straightforward alt-rock approach of Number Girl) Mukai would use ZAZEN BOYS as a vehicle for experimentation and for profoundly stretching his creative boundaries. Although ZAZEN BOYS's first album was a direct continuation of the more experimental side of Number Girl, subsequent releases diverged greatly in exploring intricate arrangements and changing time signatures, delving into house/electronica/funk/folk/spoken word, all with a heavy dose of unpredictability but maintaining a modicum of pop sensibility. This progressive, "less accessible" approach alienated a good portion of the original core of Number Girl fans, but has garnered a generation of new fans who appreciate Mukai's sophisticated, improvisational genius. ZAZEN BOYS greatest strength as a band lies in its passionate live performances characterized by a high degree of improvisation, impeccable cohesion and virtuosic, unmistakable skill. On stage their veteran swagger and instrumental mastery exude an aura that is "larger than life" compelling the audience to believe they are witnessing the pinnacle of musicianship. Although ZAZEN BOYS will never achieve the commercial success of Number Girl, Mukai's current project has already accomplished much more in expanding the scope and capabilities of Japanese rock and music in general.